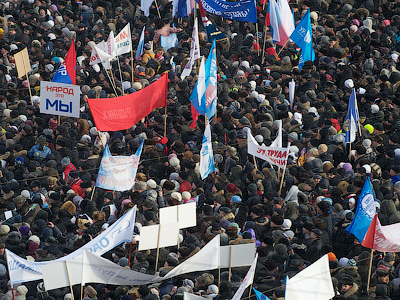 Moscow is bracing itself for an upcoming rally by Russia’s “street” opposition in support of fair elections. Anastasia Karimova has come up with a way to promote the event – bikini-style, though the climate is hardly suitable for swimwear right now. ­“Frost doesn’t scare us!” reads Anastasia’s placard with details of the 50,000-strong march to be staged in Moscow on Saturday. Like many others, Anastasia plans to protest the results of Russia’s recent parliamentary poll, which in December delivered victory to the United Russia party associated with Prime Minister Vladimir Putin and President Dmitry Medvedev. As Anastasia poses for a photographer in her swimsuit, Moscow is going through another usual late January day, with thermometers reading minus 14 degrees Centigrade, despite the somewhat sunny skies and light winds. But the activist says the prospect of being part of the “For fair elections” movement is keeping her warm. 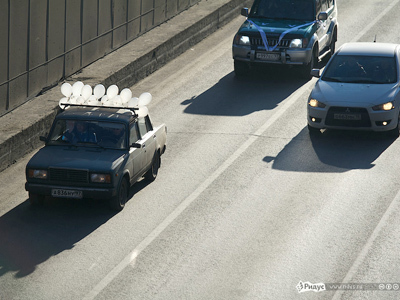 Anastasia is referring to Sunday’s procession of cars, over a thousand of which were driven along one of Moscow’s central ring-roads in an event dubbed “The White Ring,” designed to promote the rally in the capital this coming Saturday. 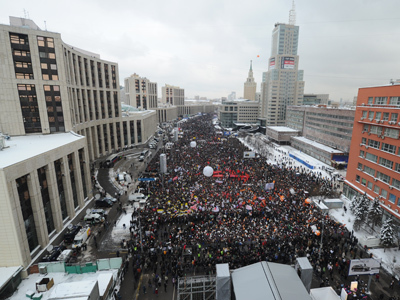 The previous two rallies, which took place in December and were staged at Sakharov Avenue and Bolotnaya Square respectively, attracted thousands of people – something unseen since the dramatic 1990s. Moscow authorities have approved the 50,000-strong march and the Facebook page for the event shows some 25,000 people have so far confirmed they will take part. Protesters are questioning the ballot count in December’s parliamentary election and want to ensure the upcoming presidential poll will not involve any vote rigging. 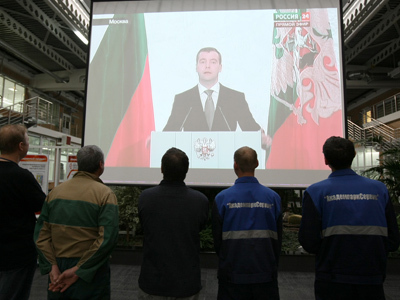 Reform talk: Medvedev`s speech shaped by protests?